Hey, look what we made! Yup, it's a cute new door mat. Or as I like to call it, the *Happiest Door Mat Ever*. My best friend Kelsey wanted a new door mat for her apartment, so she brought over this Ikea Sindal door mat on Saturday. We put on our crafty pants and got right to work! The first step was to decide what she wanted it to say. Once we had that settled, we made handmade stencils out of paper plates. I drew each letter onto the bottom of the paper plate base and then cut it out with scissors. Easy and free! Then we picked a super cheerful color palate using 77 cent acrylic craft paints from Michael's. We taped the stencil to the mat and used a round sponge brush to blot the paint onto the mat. The key is to press down the stencil tight to the mat to eliminate bleeding, since the mat is not an even surface. And it's as simple as that! Isn't it cute? 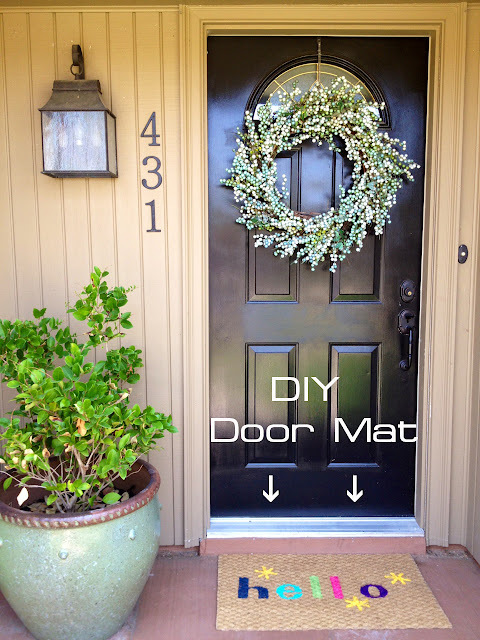 Total cost for this DIY was $4.99 for the Ikea door mat, since we already had the painting supplies and made our own stencils. Yep, I would say that is one happy door mat. Who wouldn't feel welcomed when they see that in front of the door?